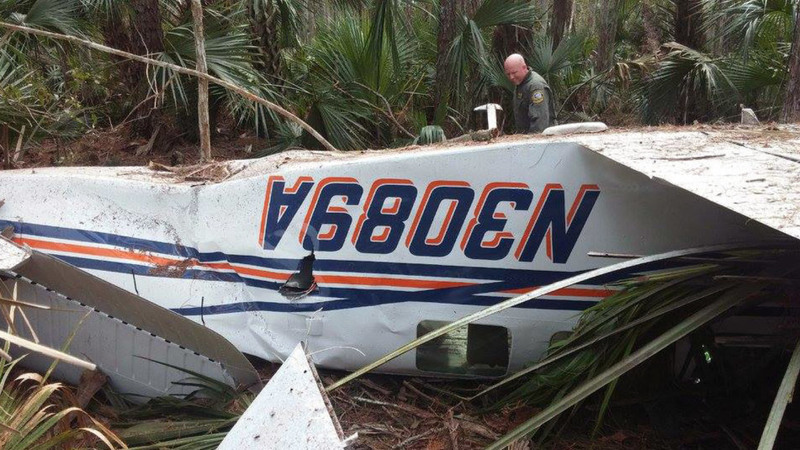 On November 9, 2016, about 1330 eastern standard time, a Beech 36, N3089A, was substantially damaged shortly after takeoff from Flagler Executive Airport (FIN), Palm Coast, Florida, when it impacted wooded terrain in Ormond Beach, Florida. The private pilot and the pilot-rated passenger were seriously injured. The airplane was registered to a private company and operated by the private pilot as a 14 Code of Federal Regulations Part 91 personal flight. Visual meteorological conditions existed at the time of the accident and no flight plan was filed. The flight was destined for Deland Municipal Airport (DED), Deland, Florida. The pilot stated that he and his passenger, who was also a pilot, departed FIN for the 15-minute flight to DED, to get lunch and visit a local store. He said that he leveled off at an altitude of 2,000 ft mean sea level (msl), with the flaps and landing gear retracted, and trimmed the airplane for level flight. The autopilot was not engaged. The pilot said the airplane then "suddenly" rolled to the right and he was unable to stop the roll with opposite aileron. The airplane continued to roll inverted and the pilot-rated passenger took control of the airplane. The pilot-rated passenger shut off the engine (to avoid a fire if they crash landed) and pressed full left rudder to bring the airplane back to level flight; however, the airplane was "sliding to the right" in a descent. 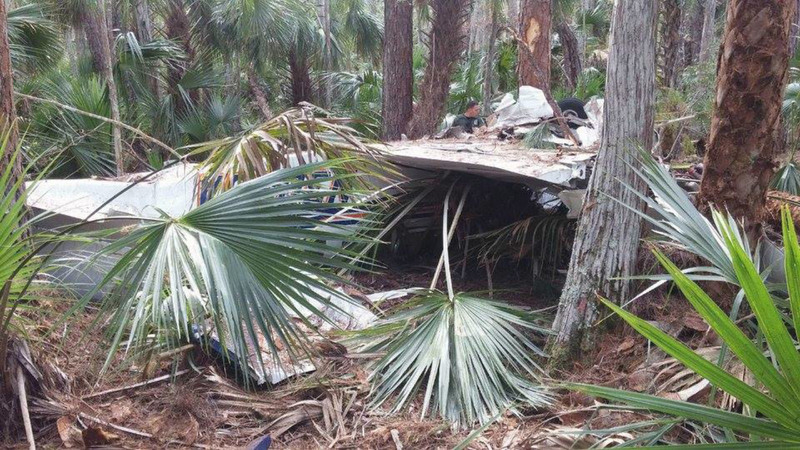 The pilot-rated passenger slowed the airplane and flared into a stand of trees. The pilot recalled the wings striking the trees and "bouncing around like a ping pong ball" before coming to rest. There was no post-impact fire. 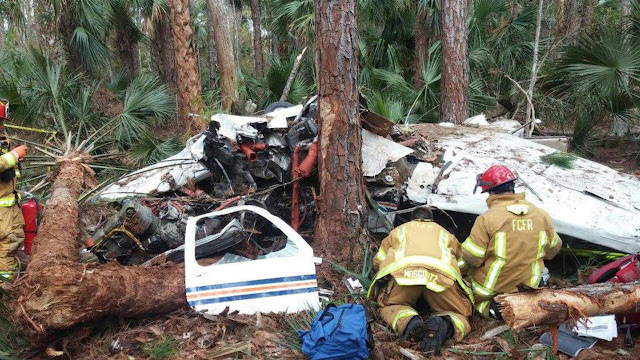 The pilot could use his cell phone and called 911. The pilot stated that has no idea what caused the airplane to suddenly roll and assumed a flight control cable "snapped." He did not hear anything unusual prior to the upset that would have been consistent with something breaking. The pilot said the rudder and elevator controls remained functional, but the ailerons were unresponsive. The pilot recalled looking at the ailerons when he moved the control wheel, and they did not move. The pilot-rated passenger, who was also an certificated airframe and powerplant mechanic, stated that he and the pilot were flying to DED to pick up a vacuum pump. The weather was clear skies and light wind. He said that about 3 to 4 minutes into the flight, when the airplane was level at 2,000 ft msl, the airplane began to roll to the right. When the airplane reached a 90° bank, the pilot "threw his hands in the air" and the pilot-rated passenger took control of the airplane. He said the airplane continued to roll despite applying full left aileron. The airplane rolled inverted and entered a dive. The pilot rated passenger described the roll as "pretty abrupt" and from the time the roll began until the airplane was inverted was about "two seconds. "He said he closed the throttle to slow the airplane down and told the pilot to turn off the master switch. The pilot-rated passenger said he still had use of the elevator and could get the airplane back to level flight, but the airplane had descended to 300 ft. He then pulled the mixture to shut off the engine about 30 seconds before the airplane collided with the trees. The pilot-rated passenger said they were not trying to perform any aerobatic maneuvers and felt the airplane rolled due to a broken aileron cable. He said that he was wearing noise-canceling headsets and did not hear anything snap or break prior to the airplane rolling. A postaccident examination of the airplane wreckage was conducted under the supervision of the National Transportation Safety Board. 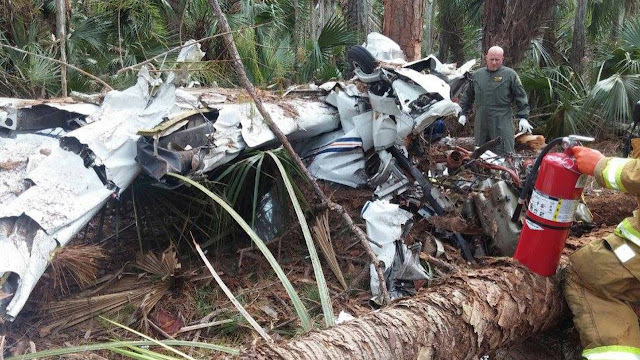 The examination revealed the airplane first struck a 30- to 40-foot-tall palm tree with its right wing and then struck a second tree with the right wing as it descended. A 9-foot-long section of the right wing separated from the airplane and was found at the base of the second tree. The airplane then impacted the ground about 125 ft from the first tree impact and came to rest inverted up against a third tree. The engine and the propeller both separated from the airframe and were found forward of the main wreckage. Further examination of the separated section of the right wing revealed two semi-circular leading-edge impact marks. Imbedded in the marks were remnants of tree bark. One impact mark was about 3 ft from the wing tip and the other was about 7 ft from the tip. The left wing remained partially attached to the airframe by control cables and exhibited leading edge impact damage. The right horizontal stabilizer separated from the fuselage. The stabilizer exhibited brown scuff marks on the bottom side about mid span and was buckled in half toward the bottom side. The left horizontal stabilizer remained partially attached to the fuselage. The vertical stabilizer separated from the fuselage. It exhibited a downward semi-circle diagonal indention on the right side starting at the leading edge about 10-inches from the base to the rudder. The vertical stabilizer and rudder were buckled toward the right side in line with the diagonal indention. Flight control cable continuity was confirmed from the flight control surfaces to the cockpit input controls for the rudder, elevator, and aileron. The right aileron UP flight control cable was separated at the turnbuckle which was located inside the cabin and the aileron balance control cable was separated in the right wing. The separated turnbuckle and a section of the aileron balance control cable were sent to the National Transportation Safety Board's Metallurgical Laboratory for further examination. Examination of the separated cable ends revealed they were both separated due to overstress. With no electrical power on the aileron servo, the capstan rotated freely. Examination of the right wing revealed skin and wing rib tearing around the aileron balance flight control cable from the wing walk area (~wing rib 45.00) outboard to the wing separation. The wing ribs lightening holes for the right wing UP flight control cable at wing ribs: 45.00, 66.00, and 80.047 outboard to the wing separation exhibited tearing and skin protrusion in an outboard direction. Examination of the engine revealed no pre-mishap anomalies that would have precluded normal operation. The pilot held a private pilot certificate with a rating for airplane single-engine land. His last Federal Aviation Administration (FAA) third-class medical certificate was issued on March 6, 2015. He reported a total flight experience of 420 hours. The pilot-rated passenger held a private pilot certificate with ratings for airplane single-engine land, airplane single-engine sea, and multiengine airplane. His last FAA second-class medical was issued on January 8, 2015. At that time, he reported a total of 2,500 flight hours. The pilot-rated passenger also completed the airplane's last annual inspection on April 21, 2016. At that time, the airplane had accrued a total of 5,886.0 hours. He said that at the time he inspected the airplane, the flight control system was in "good condition." The airplane had flown about 23 hours since the annual inspection. Weather reported at Ormond Beach Municipal Airport (OMN), Ormond Beach, Florida, about 5 miles southeast of the accident site, was wind from 030 degrees at 5 knots, visibility 10 miles, scattered clouds at 3,200 ft, overcast clouds at 7,000 ft, temperature 22° C, dew point 17° C, and a barometric altimeter setting of 30.02 inches Hg. 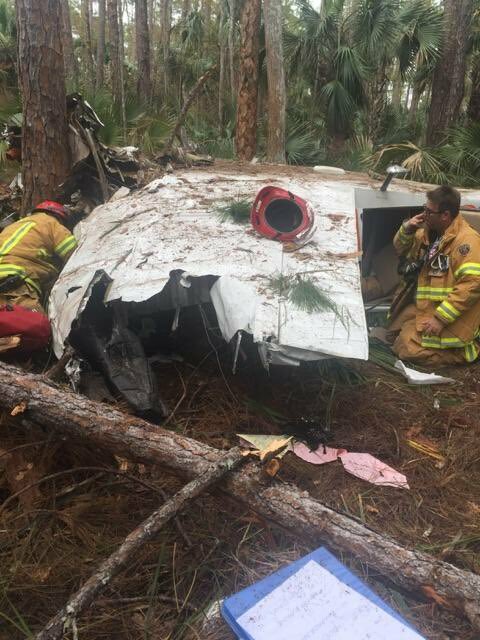 On November 9, 2016, about 1330 eastern standard time, a Beech 36 single-engine airplane, N3089A, was substantially damaged shortly after takeoff from Flagler Executive Airport (FIN), Palm Coast, Florida. The private pilot and the pilot-rated passenger were seriously injured. The airplane was registered to a private company and operated by the pilot as a 14 Code of Federal Regulations Part 91 personal flight. Visual meteorological conditions existed at the time of the accident and no flight plan was filed. The flight was destined for Deland Municipal Airport (DED), Deland, Florida. According to law enforcement personnel, the pilot stated that he thought a flight control cable had failed, which resulted in an uncontrolled descent into wooded terrain. The airplane wreckage was retained for further examination. The pilot held a private pilot certificate with a rating for airplane single-engine land. His last Federal Aviation Administration third-class medical certificate was issued on March 6, 2015. At that time, he reported a total flight experience of 370 hours. Weather reported at Ormond Beach Municipal Airport (OMN), Ormond Beach, Florida, about 5 miles southeast of the accident site, was wind from 030 degrees at 5 knots, visibility 10 miles, scattered clouds at 3,200 feet, overcast clouds at 7,000 feet, temperature 22 degrees C, dew point 17 degrees C, and a barometric altimeter setting of 30.02 inches Hg.